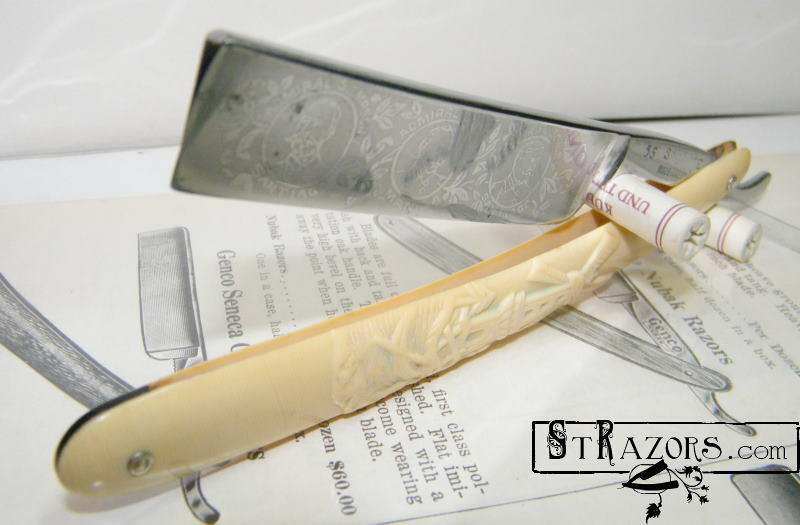 STRAZORS.com - all about classic razors - The Admirals. The razor was made approximately 1920-1940. 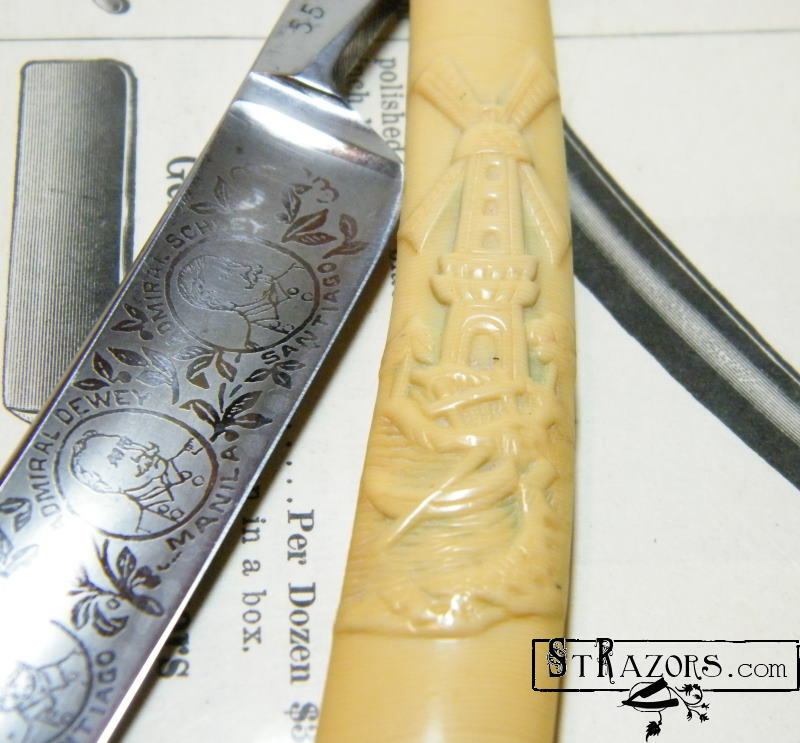 Most likely, such razors were made by Germania Cutlery Works. 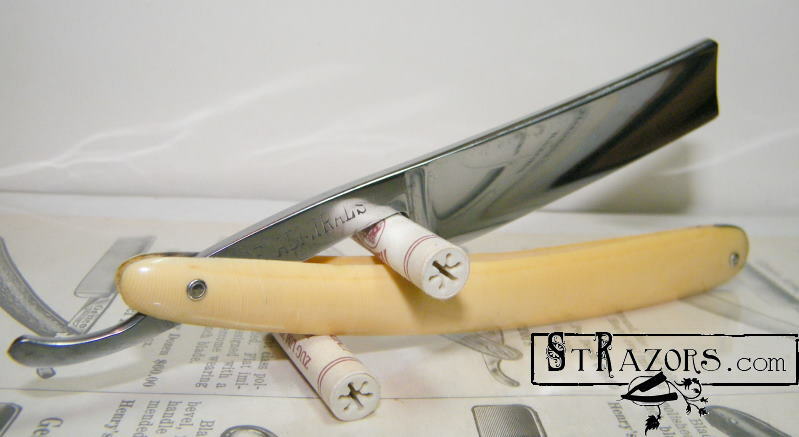 "...Another razor of this style is marked on the shank "55S Sheffield Steel E, Made in Germany." The reverse side reads, "The Admirals". According to this book, the American public wanted action following the sinking of the USS Maine in the Havana harbor. The three Admirals furnished some of that action. Admiral Dewey accomplished the destruction of the Spanish fleet in Manila Bay. Admiral Sampson defeated a Spanish fleet attempting to escape his blockade of Cuba. Admiral Schley fought a very successful Battle of Santiago. Spain, as a result of their losses, agreed to relinquish Cuba, and cede Puerto Rico, the Philippine Islands, and Guam. Most remarkable is that the Admirals achieved their victories with very little loss of American life. No wonder the Admirals were considered fitting subjects for a commemorative razor." From the Knife World article August, 1982.